Last year we designed and created a lot of new e-learning templates and now we have gathered data about the most popular ones for every authoring tool. You will find different kinds of games and quizzes here, as well as some theme based templates! Take a look and see if you are already using our top-selling templates! The absolute favorite last year was our ZOO trivia game template! Wonderful illustrations with colorful zoo animals – this is definitely an eye catching template! 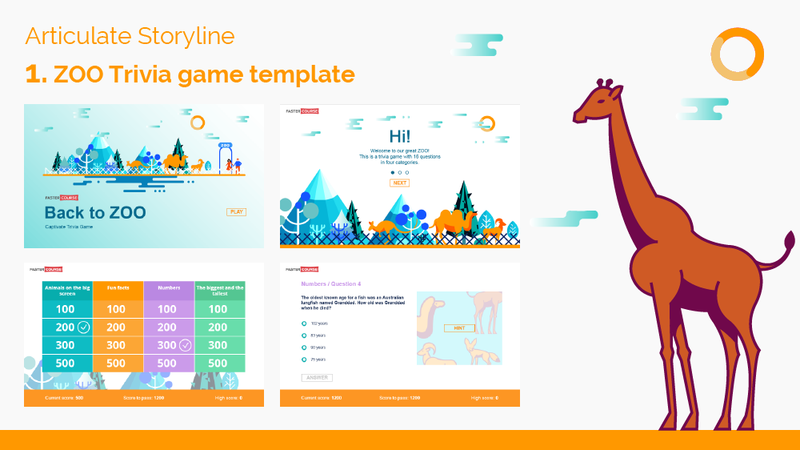 This Storyline ZOO template is a game with 16 questions in four categories where each question is worth a specific amount of points. You can use this template as an entertaining way to check the user’s knowledge about any topic, and you can use it separately or combine it with other e-learning templates to create a more extensive course. Check out the demo here – Storyline Zoo Trivia Game template. This was our first theme based template. As we have developed several Anti Money Laundering courses ourselves, and we know that this is one of the most popular e-learning course topics in the financial industry, we thought that it would be a good idea to create an AML course templates package. We are glad to see that you agree with us by placing this template in the second place! Check out the demo here – Storyline AML template. This is one of the most widely used template set in our library. It is all about the modern looks and simple design. Colors, fonts and design elements are carefully selected to fit this light and easy learning style. You can adapt it to all your needs! Check out the demo here – Storyline Light Info template. This is a fully functional Storyline game, built on a “popular choice” game concept. In this template you can easily change the question, answers, values etc. Fully customizable game that you can use to teach anything! 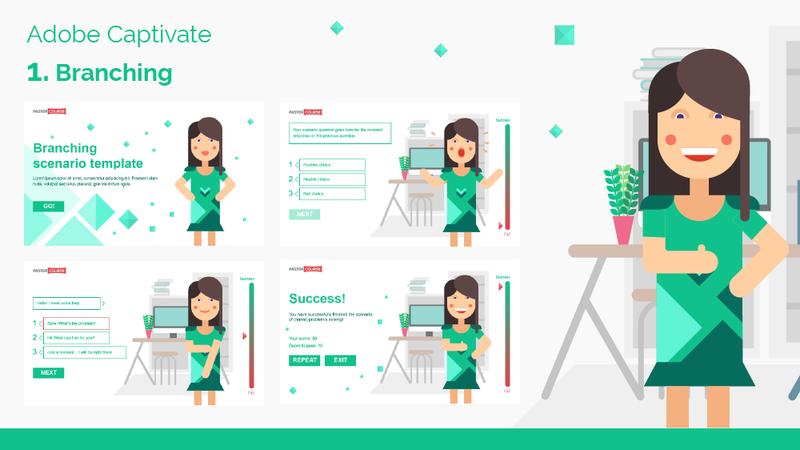 Check out the demo here – Storyline Popular Choice template. By popular demand, we created this template package for showing office floor plan. This is a fully customizable office map template, and you can move the rooms around and place them in any combination you want! Great way to introduce your new employees to your workspace! Check out the demo here – Storyline Office Map template. This colorful branching template has won our Captivate users hearts! Our branching template allows to easily build branching simulations. User is asked a question and depending on the answer the next question changes. If your answer is correct, the lovely lady will award you with a smile! Check out the demo here – Adobe Captivate Branching template. These are beautifully designed and very well built e-learning templates, that you can use in any e-learning project you have. The design is simple, but this template has proven its value to our customers many times. Check out the demo here – Adobe Captivate Basic template. This Captivate template set is created to make your data visualization pages look great and be easily modifiable at the same time. Everyone has some data to present, but usually they are afraid that the project will look awfully boring. With Data template you can make boring information look more attractive! Check out the demo here – Adobe Captivate Data template. This template package was created as an addition to the Light template family, that’s why you can only find test pages here. Single choice, multiple choice, drag and drop and even more beautifully designed test pages. Check out the demo here – Adobe Captivate Light Test template. This was an experiment for us and we are really glad you enjoyed it as much as we do. Fresh design, new template pages and bright colors – that’s all you need to get attention with your e-learning course! Check out the demo here – Adobe Captivate Cakes template. 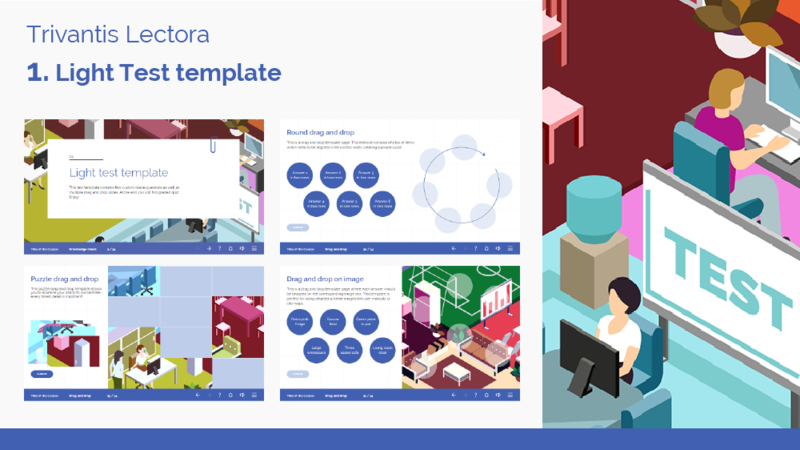 This Light Test template has become the most downloaded template set from all Lectora e-learning templates made in year 2017! We believe that test is one of the most important parts in e-learning projects and this one will entertain your students with different drag and drops and even a puzzle! Check out the demo here – Trivantis Lectora Light Test template. This is the second place for Trivantis Lectora templates – Anti Money Laundering theme based template. This is also the second time this template appears on our top and we are glad you find it useful. Check out the demo here – Trivantis Lectora AML template. This template you can find only between Lectora templates, because it is designed specially for Lectora. This package has a work safety in a construction site theme, but it can be used for anything else as well. Beautiful and modern design responsive templates package for all Lectora users. Check out the demo here – Trivantis Lectora Safety in Construction Site template. Office Map is one of the most popular and most interesting template set in our Lectora template library. Add some useful information about your office and introduce it to others! Check out the demo here – Trivantis Lectora Office Map template. With this template you will definitely win some compliments! Add it to your course and suprise others with the colours! Check out the demo here – Trivantis Lectora Zoo Trivia Game template. Did you noticed how we started with the Zoo template and ended as well? We believe that this isn’t a coincidence and every one of you like to bring some colours to your everyday life. And we have to admit – this is one of our favourite templates too. We enjoy creating new e-learning templates and games and if you have any suggestions of what would you love to see in our next years top, send us an email or contact us through our Facebook account.